Pet owners keeping reptiles in captivity as household pets may sometimes find that their pets have a nutritional deficiency. 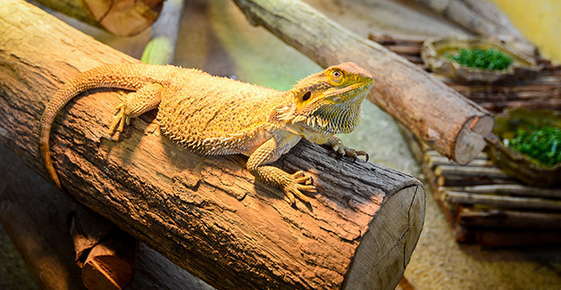 Metabolic bone disease is "the most common nutritional deficiency affecting captive reptiles," advises veterinarian Fredrick L. Frye in Reptile Care: An Atlas of Diseases and Treatments. Dr. Frye suggests that the disease is a result of dietary intake creating an excessive amount of phosphorus in the animal's body. Metabolic bone disease (MBD) in reptiles can often be overlooked until the pet seems to have broken toes or a leg that presents as impaired. Bone produced by the animal's body is brittle, fragile and can be spongy in texture. When your pet lizard or iguana jumps from one hard surface to another the bone can easily fracture. Normal movements your pet makes can be painful with the disease. Your pet reptile may experience discomfort when walking or moving around a cage, terrarium or your home. Young lizards with metabolic bone disease may have skulls that fail to grow larger and become longer. They can retain the rounder shape seen at birth. Early signs of metabolic bone disease in reptiles can be recognized when watching your pet closely. If you see that your iguana or lizard is using its front legs to move and the back legs are dragging you'll want to contact your veterinarian for an immediate appointment. Lizards and iguanas, for example, use all four legs to move around. Their tails do not remain limp behind them with normal movement. There is a natural lift to many reptile tails that supports their forward motion. An iguana may be able to lift the front of its body, yet the torso and tail will be dragged due to the disease. Watching your pet you'll be able to see if it looks jerky while it walks. Its limbs or muscles may show twitches and tremors. You may experience your pet's shakiness when holding it. When handling your pet, you may also find that it has knobs or bumpy places along the bone ends and between the bones of its back or tail. Your vet will always check for knobs and bumps during an office exam. Eating may become decreased and weight loss may occur if your pet's jaw is affected by the disease. Advanced cases of metabolic bone disease may also include anorexia and fractured bones. Dr. Frye advises that "severely deficient reptiles tend to be lethargic and may only be able to drag themselves along the ground. A reptile lacking the ability to lift it's body from the ground when sitting or walking often suffers from a moderate to severe case of MBD." When a diagnosis is made for metabolic bone disease, your veterinarian will guide you with treatment recommendations and nutritional guidelines for your pet. Sign up using the form below or call us at 916-722-0400. We have a talented team of Groomers on-site. From bathing to breed specific hairstyles our groomers can accommodate most requests. "The best place I could ever take my animals. Everyone there from reception to techs to vets are kind, knowledgeable and professional. Dr. Zucca seems to have a sixth sense when it comes to treating our pets. All the veterinarians there are exceptional. This place understands people live on a budget and don't always believe the best treatment is the most expensive treatment. Love, love, love this place!"